Las Vegas is a food lover’s town. There is a restaurant that will satisfy any craving, curb any appetite, and cure anyone’s culinary curiosity. There are countless numbers of eateries along the famous Strip, at last count there were almost 2500 foodie spots for gamblers and show-goers to flock to. And Celebrity Chef’s have seized the opportunity to open their own signature restaurants from Giada’s at The Cromwell to Bobby Flay’s Bobby’s Burger Palace at the Mandarin Oriental to Gordon Ramsay BurGR at Planet Hollywood. 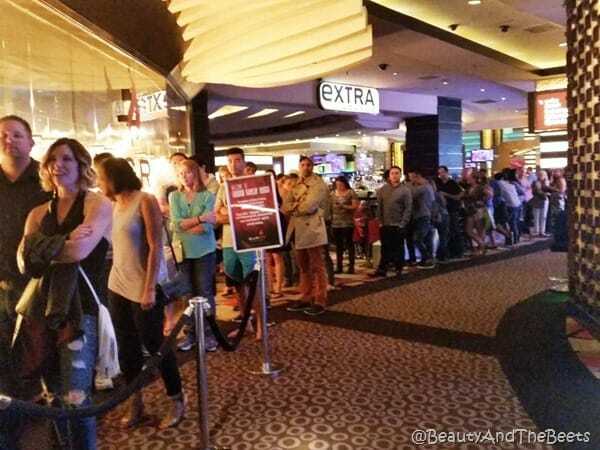 The past few visits I have made to Vegas, I have been interested in trying out Gordon Ramsay’s BURGR but there seems to always be a line. However, on one Friday night, I was able to snag a table with some friends before we headed to the Britney Spears concert in the same hotel/casino. We waited about 30 minutes for our table which was far better than the hour and a half wait I had seen on most nights. Though the place is casual, it is also quite crowded as they managed to jam a large number of tables into a small space. We were inches away from our table neighbors. If I hadn’t been so hungry I probably would have spent more time fretting on our accommodations. However, we greeted quickly by our server and we didn’t wait very long for our food at all. This is a turn and burn restaurant- get the people in, feed them quickly, get them out and refill the seats immediately. Somehow I didn’t seem to mind it though. We were, after all, on our way to a show. We ordered a side of Parmesan Truffle Fries for the table, of which we split. 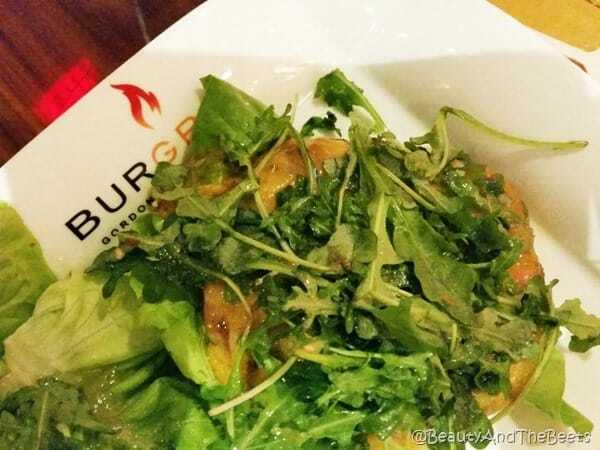 Gordon Ramsay BurGR uses a Kennebec potato which makes the fries less starchy and greasy. 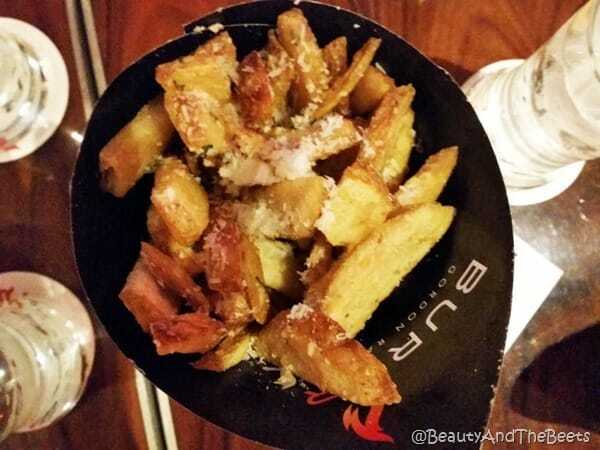 The fries were thick cut and generously coated with a truffle seasoning. Very tasty. I opted for the Britianna Burger, substituting the beef for the Vegetarian-friendly portabella patty. 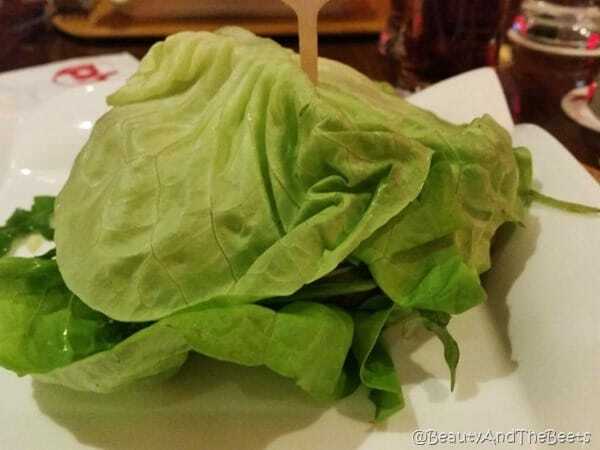 I also opted for no bun and it served wrapped in lettuce. Topped with English sharp cheddar, mango chutney and arugula, this was one of the tastiest burgers I have ever experienced. 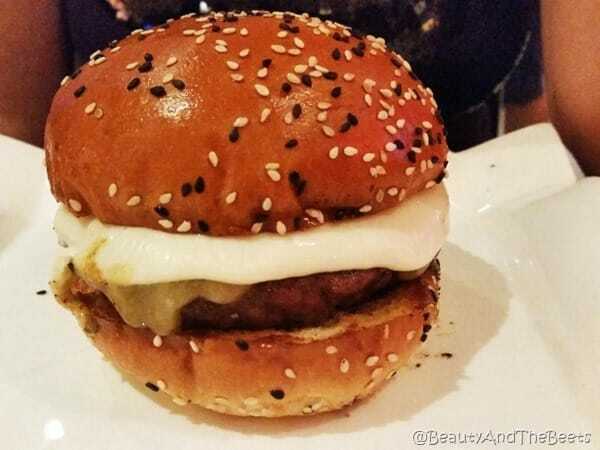 I am always quite skeptical of mushroom patties, as they are often overcooked and rubbery, but at Gordon Ramsay BurGR, the mushroom was seasoned well and cooked perfectly. We chose to not indulge in dessert but there are plenty of options. The push pop sticky toffee pudding sounded amazing! So if you are a party of three or more, approach the host stand, leave you name and you will be called when your table is available. This may be one of those times it pays to be larger than a party of two. Twosomes wait in the line and are sat as two tops open. When we left the parties of two line was wrapped down the front of the restaurant and into the casino area. 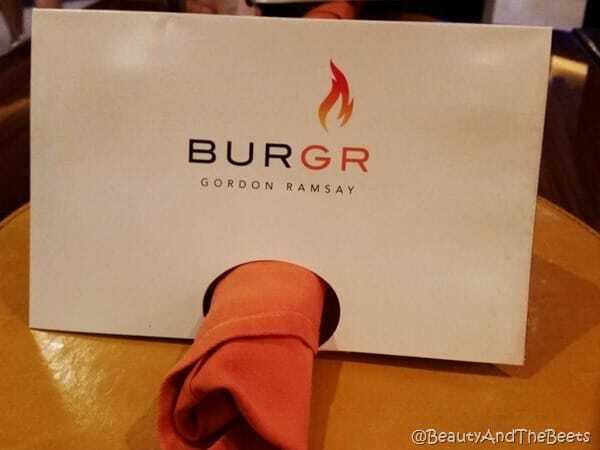 However, I can see why Gordon Ramsay BurGR is so popular. The food is really good and reasonably priced for Las Vegas. And perfect as a pre-show meal. 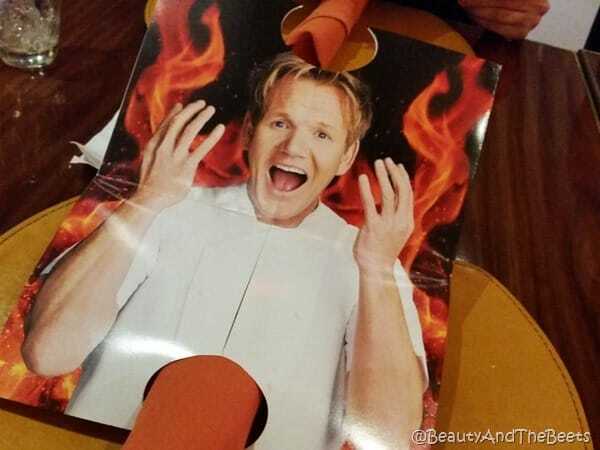 Gordon Ramsay BurGR is located inside the Planet Hollywood Hotel and Casino. 4 1/2 out of 5 sprouts.